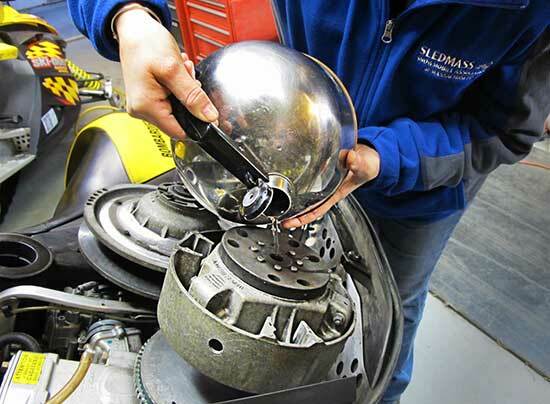 Removing a snowmobile clutch with water, also know as the water trick, is becoming a common technique in snowmobile garages. Removing a primary clutch is straightforward if you have the proper tools. Even then, a stubborn clutch sometimes refuses to pop. The clutch puller is threaded all the way in and nothing happens. There are several remedies. A common technique is to strike the end of the puller with a hammer, letting the shock of the blow break the taper’s death grip. Others simply let it sit overnight with the puller under tension. Oftentimes it will simply pop free in a few hours. Some place a heavy dab of grease on the end of the puller, allowing hydraulic pressure between the end of puller and the void where the clutch bolts into the crankshaft to build. This technique leads us to the water trick. It’s important to note that I’m not a real doctor or professional mechanic, although I do play one on YouTube (see below). If you choose to try any of these methods, you do so at your own peril. I’m not responsible for injuries or damage to you, your snowmobile, your pets, or anything else. If you’re unsure, seek professional advice. The scenario: You need to remove a clutch but don’t have a puller, or traditional methods aren’t working. The theory: Water fills that void where the puller would go. By threading a bolt into the clutch, hydraulic pressure builds in the void, forcing the clutch off the crankshaft taper. Before we go any further, did you know that a snowmobile can be started by simply spinning the clutch with your bare hands? Did you know that this could remove your fingers from their proper location? Since we are going to be handling the clutch, it’s vital that the ignition key be removed and the kill switch be in the “kill” position. You could even disconnect the spark plug wires from the plugs for good measure, that’s what I do. After removing the belt, use a clutch holding tool, or another method to keep the primary from spinning, and remove the center bolt. Next, you need to roll the snowmobile on its side and safely support it. If you haven’t done this before, do a quick Internet search for guidance. It’s important to avoid damage to the sled, as well as fuel and oil leaks, so take appropriate measures. The bolt that secures the clutch is on top, the puller below. Note that the puller is slightly bent near the tip from force. If you have a Ski-Doo, you can typically use the same bolt that secured the clutch to the crank for the next step, since it’s the same exact tread size. On other brands, the bolt that secures the clutch to the crank is smaller than the internal threads of the clutch, itself. Remember, we are threading a bolt into the clutch to remove it, not the crank. The threads are close to the outside face of the clutch. No big deal, all you need is a larger bolt that threads into the clutch. You can look up the clutch puller thread size for reference. A tight seal is needed between the bolt and the clutch threads to build pressure. Wrap Teflon tape around the bottom inch of the bolt with a slight taper, wrapping thicker as you go. Five or six wraps should do it. Wrap in the opposite direction of the bolt threads, that way it won’t peel off as it’s screwed in. Pour water into the void where the bolt was until it starts to flow out the top (Figure 5). Avoid air bubbles, as air compresses and can be unpredictable. Don’t be tempted to use carbonated drinks, for the very same reason. Plain water does not compress, it builds hydraulic pressure, which is what we want. Next, thread the Teflon wrapped bolt into the clutch by hand, then use a ratchet. It only takes a few turns to pop. Since the clutch can release with some force (regardless of what method you incorporate), use a ratchet extension to give your hands some space. Wear gloves and eye protection, and don’t hang directly over the work area. If it doesn’t work due to a poor seal, remove the bolt, wrap it a little bit more, and repeat. After it’s removed you can roll the sled back on its track and finish the job. Removing a snowmobile clutch with water is simple, so much so, that you may never use a traditional puller again.